Another photography tips post! 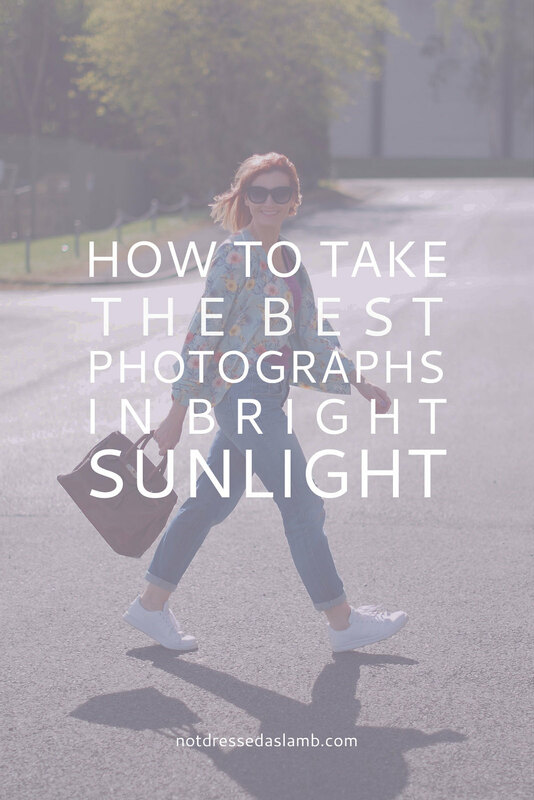 Today I’m talking light, which is the key to getting better pictures. The more light you have, the higher the quality of your pictures, because photographic film reacts to and likes light (I know digital cameras don’t use film – it’s just easier to explain the old fashioned way)! Think of it this way: The more light there is travelling through the camera’s lens and shutter, the more information the film has to interpret. The more information on the image – the sharper and more detailed the photos. You could break down your (outdoor) lighting conditions into three very basic groups: cloud, rain and sun. Cloudy is straightforward – your light will be evenly diffused wherever you shoot, so you’re not really restricted in any way unless it’s extremely dark due to extra heavy cloud cover. Raining is obviously tough but there are ways round it – I’ll do photographing in the rain in another photo tips post. 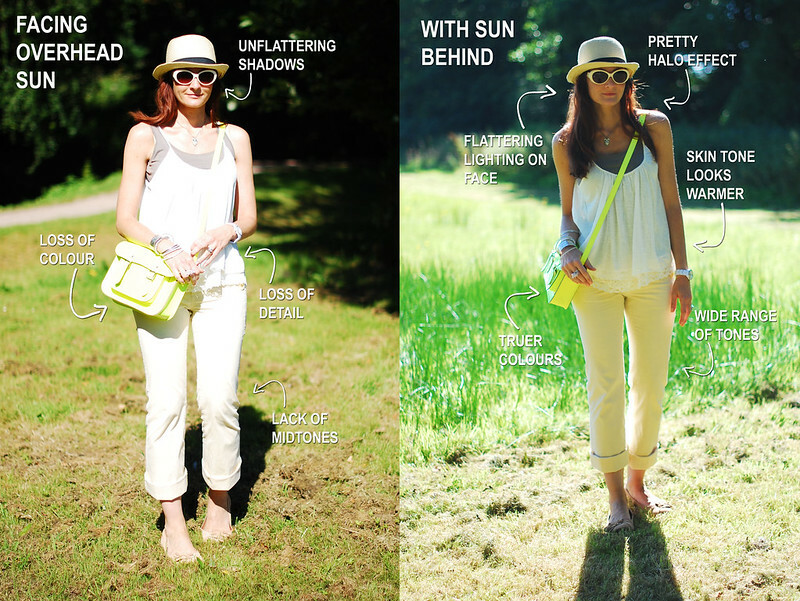 And if it’s sunny, you’ve actually got a lot of different effects you can create – so read on for the low-down! Some bloggers feel a bit of a poser wearing sunnies (doesn’t bother me), but don’t forget they’re an accessory in themselves. 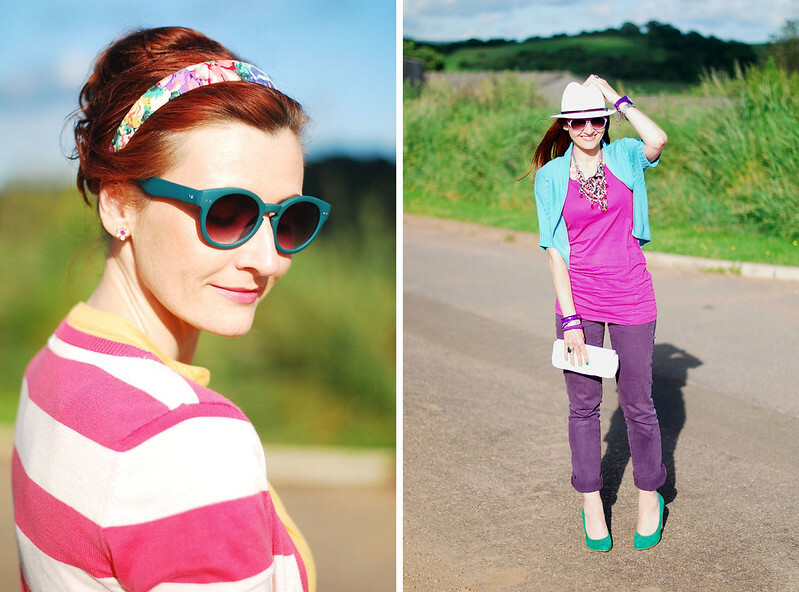 If the sun is blinding your eyes they really are a necessity… you don’t have to wear them in every outfit post. So be brave and move your position in relation to the sun. It may take a few goes to get the shooting angles and exposure correct, but it really is worth it. Please note: The photographer must not, under any circumstances, look directly at the sun either through the lens or otherwise if shooting into the sun. Safety first, folks. As you can probably tell, the sun had gone behind the clouds for this shot. But because the cloud cover was very thin, it cast a really eery light. It was a sort of strange glow, which created a lovely depth to the image and made the outfit pop. 3. Back in the original position, but with the diffused light when the sun went behind the clouds… we knew straight away this one looked the best. The beach photo on the left was taken literally as the sun was setting on the horizon, so the light was very soft and very warm. And the image on the right shows how creating flare from the sun during golden hour is easier for the photographer than at midday (because the sun is much weaker). With some careful positioning, your photographer can position the sun to just peek out from behind you and create some beautiful sun flare spots. This takes practice, but it’s probably my favourite effect to create with the sun. The golden hour is a favoured time of day for many photographers to shoot – you’ve just got to be ready to get your timing spot-on (you can find yourself in a race against time with the sunset, but the results are worth it). I know I’ve said don’t shoot in harsh sunlight… unfortunately I’m going to give some examples of where it can work! Always be ready to break the rules (though my ‘rules’ are really only tips of course). Like the paler colours above were bleached out facing strong sun, these vibrant colours would have been deadened if the sun had been behind me. With some exposure experimentation and correct angles (to avoid a really big, dark under-nose shadow), we got depth, tone and good contrast all at the same time. The stripes of the nautical outfit were echoed in all the lines of the horizon and gates in the background, and the sun on the field made the green luminous, giving a great contrast to the white top. And it goes without saying that if you have a gorgeous, sandy beach to shoot on, you’ll want to take advantage of the bright white sand and blue sea – especially if your outfit is a dark contrast as mine was. Let me know if these seem doable – and please do come back at a later time to report back on how (if) they have helped you at all! The best advice really is to experiment. 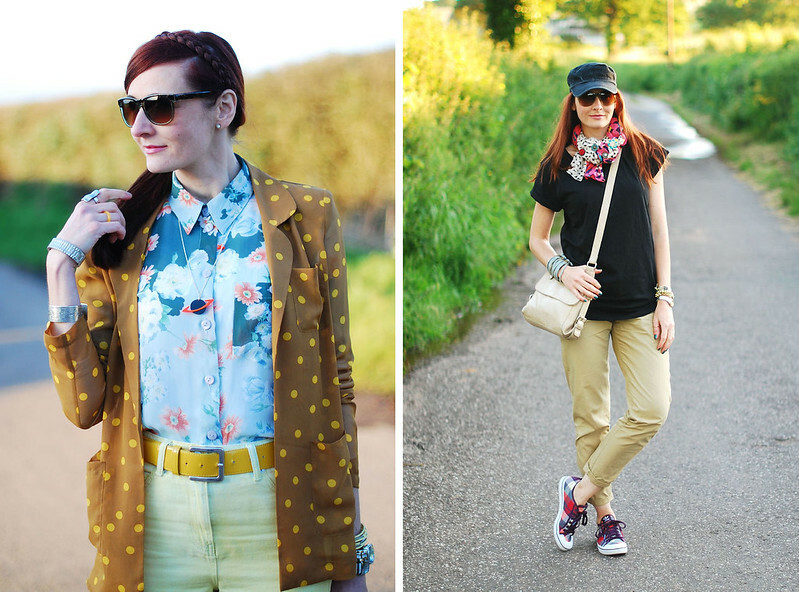 I’ve given examples only from my outfit posts because I could give you details of how we came to shoot them that way, but do look at more than just the outfits of your favourite blogs. Study their images. Look at the lighting and the position of the sun. Are they standing in the shade or in the sunlight? What does the time of day appear to be? Rarely are they standing under and facing harsh, midday sun… at least, not without sunglasses! But if you find any good examples that prove me wrong, leave a comment with the link to a particular post, I’d love to see them! You're so photogenic! Very helpful post, thank you! I'm usually whipping out my iphone and desperately hoping it will work out ok! Awesome tips! I'm gonna have to bring a journal with me while taking pictures just so I can keep up with all this goodness. Thanks for sharing! wow great tips. Do you have any tips on a non dslr camera? Just bought a Canon sx40 HS and it does take good photos if taken by me however if my husband's turn to take my photos it is always not as clear no matter how I teach him how to handle the camera so I don't even want to buy a dslr because there is no point since he's my photographer, sigh.. This is my first time on your blog and I absolutely love it! Also, these photography tips are super helpful. Thanks for posting! I went to my camera supplier (a great shop with good service just around the corner) twice because of your advice. I am now in the process of returning my camera and lenses and getting a new one from him, because I cannot do everything you advise. I followed a short course with him but that was nowhere near as instructive and simple as your explanations (told him that). You finally let me see the light (haha, this remark is by accident). Catherine, thank you so much for linking to my blog! I love all the posts in your photography series. When I first started taking outfit photos for my blog I would just take them anywhere, and sometimes they would turn out horribly and I wouldn't know why (but now I know it was because of the lighting). But eventually, through a lot of trial and error, I figured out the best locations for shooting in bright light, and the best time of day for photos. WOW – thanks for all these amazing comments, everyone!!! I'm so glad these photo tips seem to be helping everyone – even if you only get one or two ideas out of it. Glad to know it's been worthwhile! I love your "photo tip" posts, I find them really useful. I really struggle with this sort of thing, especially when it comes to lighting! thank you for sharing all these useful tips with us, love you!!!!!! Brilliant advised, Catherine, mainly living in a sunny place. these are some great tips…i mostly shoot indoors due to lack of good outdoor locations nearby and also lack of a photographer.. Thank you for the great tips!! We've been enjoying bright sunny weather the last couple of days and I've been wondering how to utilize it when taking photos. ohhhh i really needed this! thank you thank you thank you!!!!! i'm a new follower! have a lovely weekend! You are soooo sweet to be sharing these tips Catherine….MORE POWER TO YOU!! These are great tips Catherine! Thanks so much for taking the time to share your expertise. Thanks for more great tips, Catherine! I count Forever Amber and Grey Skies among my favourites as well – glad to see them featured, and look forward to checking out the others. 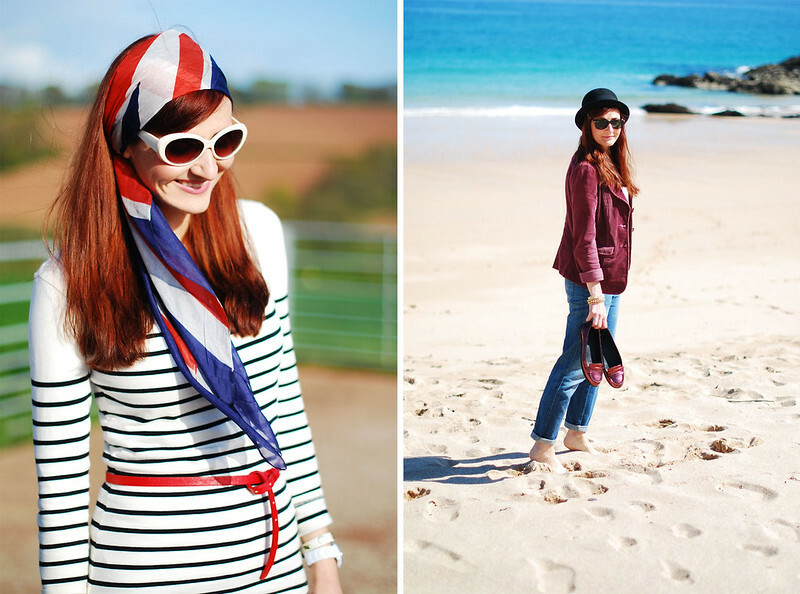 I must also add that the red/white/blue headscarf is a particularly lovely look on you!